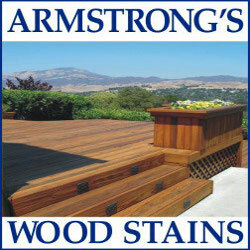 Anyone who owns a pressure washing business is faced with the ever-present temptation to offer additional services. Why not leverage an existing client base with more offerings since the cost of customer acquisition is negligible? This is especially true with external window cleaning because of the growing popularity of pure water window cleaning. • What are the strategic advantages of offering window cleaning? • What equipment will I need, and how much will it cost? • How will I train myself or my employees in pure water window cleaning? • How can I make window cleaning a profitable part of my business? The obvious advantage of adding window cleaning is that your existing customer base can be leveraged to purchase additional services from you. However, there are other advantages. For example, offering window cleaning can protect your existing client base. Many residential and commercial property owners prefer to deal with one company when given the choice. Therefore, if you offer pressure washing but not window cleaning, there is always the possibility that the window cleaner that they hire will offer your clients pressure washing, and they could decide to consolidate and use one contractor for both services, leaving your company out. Offering window cleaning protects your interests. Providing window cleaning can also open doors to pressure washing. When a potential customer calls about window cleaning, you now have the opportunity to provide prices for pressure washing as well. Relatively small jobs frequently transform into larger, more lucrative projects, with the side benefit of less time being spent in travel and more time spent in productivity. Additionally, since window cleaning is generally scheduled on a more regular basis than pressure washing, the company tends to stay in closer contact with its clients, affording additional sales opportunities. Window cleaners and pressure washers seem to have two very different mindsets. Window cleaners often start a business with very little investment, since it only takes a few hand tools to get started cleaning windows. As a result, window cleaners tend to take a minimalist approach to investing in tools and equipment. Not so for pressure washers. Bigger is better! More gallons per minute! More power! (Cue Tim “The Toolman” Taylor.) In pressure washing, the amount of money invested in equipment often directly correlates to the amount of work that can be done per hour. 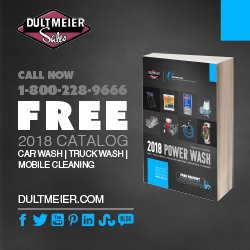 So, when a pressure washer considers purchasing pure water equipment, the mentality is often that “bigger is better,” that more expensive equipment will permit them to accomplish work more profitably. However, while this is true of pressure washing, it is not necessarily true with window cleaning. When selecting pure water equipment, there are two main questions to consider: How will I produce pure water and what type of pole should I buy? • How will I produce pure water? There are many options, and these can range in price from a simple deionization (DI) tank that costs under $200 to a multistage RODI unit with gas powered pumps that could cost several thousand dollars. While it’s easy to think that the more expensive unit would naturally be more profitable, that is not necessarily the case. First, pure water is, well, pure. It does not get any purer than…pure. Therefore, there is no inherent advantage to cleaning with water that has been purified by a more expensive system. In fact, when space is a consideration (which is often the case in a vehicle full of pressure washing equipment), producing pure water with a small DI tank can preserve space and eliminate the need to have a vehicle dedicated to window cleaning. With so many choices, how will you know which one is right for you? When choosing which purification system is best for you, the first thing you need to know is your local Total Dissolved Solids (TDS) reading. You can buy a TDS meter, which will give you a quick reading, or you can visit www. mylocaltds.com, enter your ZIP code (and/or a few neighboring ZIP codes), and see whether there is information about your locality. If so, you can click through to get very good information and advice on which purification solution is best for you and what to expect in operating costs. Either way, once you know your local TDS reading, you will be able to choose the most efficient way to produce pure water. 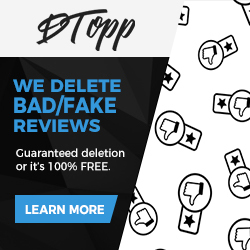 If, for example, your TDS reading is under 150, you may consider a simple DI tank to produce pure water, since the resin will produce pure water for quite some time before it expires and must be replaced, especially if you are only using it occasionally. On the other hand, if you have a TDS reading of 400, that same resin in a DI tank would be expended quickly, and a multistage unit that includes RO might be a better option. Don’t be afraid to ask questions. For example, Perry Tait of Reach-iT (perry@futureofcleaning.com) and John Lee of Window Cleaning Resource (john@windowcleaningresource.com) are always happy to help business owners make educated decisions, as are many others within our industry. • What type of pole should I buy? • What type of windows will I be cleaning? • How many stories do I need to access? • How often will I be using this pole? Let’s address length first. While it may be tempting to buy a pole that can scrub the underside of the moon, if your clientele is mostly residential, this would likely be heavier than necessary, cumbersome to use, and take up more space than needed. Typically, 25 to 35 feet is sufficient for most residential window cleaning, and choosing a pole with a shorter collapsed length will make it easier to use in cleaning houses. If, on the other hand, you will be cleaning commercial windows, you might consider a longer pole or one that allows you to buy additional sections if needed. Next, you will want to choose a material and price range. Less expensive materials are heavier, less rigid, and require much more effort to use. While these might be an option for someone who only plans on cleaning windows occasionally, if you will be using your pure water pole regularly, a hybrid or 100-percent carbon fiber pole will be well worth the investment. Remember that these poles are useful for more than window cleaning. They can be used for pressure washing tasks as well, such as scrubbing gutters, and the more rigid and light the pole is, the easier it is to operate. • Will I need traditional tools? While pure water window cleaning is all the rage, it does not replace traditional window cleaning. Occasionally you will find window styles that are not conducive to pure water window cleaning. In addition, pure water window cleaning is for exterior windows. If you plan on offering interior window cleaning, you will want at least some basic traditional window cleaning tools, such as squeegees, T-bars and covers, a bucket, soap, and some towels. While these tools may stay on the truck much of the time if you are only cleaning the exterior of modern windows, they are a necessity to own. Pure water window cleaning is easier to master and teach than traditional window cleaning. However, that does not mean that a pure water pole is some sort of “magic wand” and that windows will miraculously be clean simply by touching them. There is a learning curve, and this has led some to quickly give up, concluding that pure water window cleaning doesn’t work. That is simply not true. Remember, this is a tool, and as with most tools it takes some training and practice to get the desired results. 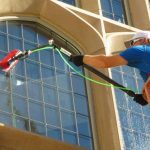 Professional window cleaners around the world use pure water window cleaning to provide a high quality product every day, so it is simply a matter of taking the time to get it right. Most people are able to learn the basics in anywhere from a couple of hours to a week. Once the skill is mastered, it is relatively easy to teach to employees. 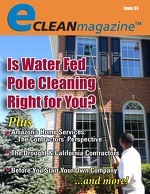 In addition, there is a free training program at www.waterfedpoletraining.com, where in a short time a person can learn why pure water window cleaning works, how to use and care for the tools, techniques that work, and how to operate a water fed pole safely. Generally speaking, pressure washing bills higher per hour than window cleaning. That said, the costs associated with window cleaning are substantially lower. Pricing varies around the country, but it is not unusual to bill $100 to $150 per hour or higher using pure water to clean exterior windows. Not too bad for a relatively small investment with a reasonable learning curve that can easily be taught to an employee. Deciding whether or not to offer pure water window cleaning is a pressure washer’s dilemma that deserves to be weighed carefully. Individual markets vary, and operating costs differ from city to city. That said, it is not a dilemma that you need to face alone. Resources are readily available to assist you, both online and from knowledgeable individuals, and with a little research you can make a sound business decision about whether your business will offer pure water window cleaning. Matt Adwell is the president of Adwell Services, a residential & commercial maintenance company based in Annapolis, MD, and has been cleaning windows professionally for the last 23 years.